Here’s how to make a keepsake posy of herbs and flowers for someone special on Valentine’s Day. Make the heart pocket from red felt trimmed with a string of pearls and a red satin bow, then fill with lavender, thyme and yarrow – or other sweet smelling dried herbs – and finish by tucking in a tiny teddy bear. This would be a lovely keepsake to leave on a pillow or night table – if you add a few drops of essential oil the scent will linger for hours. Now don’t forget to slip a little love note in among the flowers! » small sprigs of dried herbs – we used lavender and yarrow flowers, slips of thyme and a few perennial gypsophylia (baby’s breath) flowers. » optional: pin back, fridge magnet, or cord for hanging. Cut a piece of paper to the same size as the pieces of felt. Fold it half along the longest side then cut out the largest heart shape possible. If you’re not happy with the first attempt, practice until you have a heart-shaped pattern that you like. Pin the paper pattern to the first piece of felt and cut out around it. Repeat with the second felt piece. Place the two felt hearts together in a test fit; trim as needed to make both hearts match exactly. Apply a line of tacky glue around the edge of one heart, beginning and ending just under the “shoulders” of the heart and leaving the top open. Press the two hearts together, then immediately reopen and apply another line of glue over the first one. Felt tends to absorb glue but this extra step makes a good bond. Run a thin line of tacky glue around the edge of the front heart. Press the string of pearls firmly into the glue. It looks messy at first, but the white glue will be partially absorbed by the felt and should dry clear. Glue a small red or white satin bow just below the “V” of the heart. If you wish, add a few Valentine stickers. Place all of the herbs and flowers in separate piles on your work surface. If you are using silk rosebuds, trim the wire stems to about two inches. Leave lavender stems a little longer. Yarrow dries in clumps of small stemmed flowers which are used to fill out the heart and provide support for the other stems. If you don’t have any yarrow, use a substitute with similar characteristics. Small bunches of miniature baby’s breath or even dried spirea flower heads should work well. Although our posy isn’t glued in place, you may add a little glue to the bottom part of the herbs or flowers before inserting to ensure that none of the materials move or fall out. Begin by packing the heart pocket fairly snugly with three of four clumps of yarrow. On the left side, add the lavender. If necessary, trim stems to fit. Add slips of green thyme around the lavender. Add three rosebuds in a triangle design on the right side. Use more slips of thyme as greenery around the rosebuds. Nestle the miniature teddy bear in the middle of the rosebuds. Ours was firmly supported by the flowers and the side of the heart pocket but, if needed, apply tacky glue to the bottom of the bear to secure it. Add tiny sprigs of white gypsophylia, or other tiny white flowers, as an accent color wherever you think it is needed. For stronger fragrance, add a spoonful of fine rose petal or lavender potpourri to the heart pocket before adding anything else or sprinkle the posy with a few drops of rose or lavender essential oil or fragrance oil. 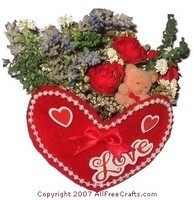 Add a pin back if you think the recipient of your herbal heart posy would like to wear it on Valentine’s Day. For fridge display, take one of those free magnets that businesses give away, cut to fit, then slip it into the heart pocket (before adding any herbs or flowers). Test first to see if the magnet is strong enough. If you think that it is, hold the heart pocket open and add a few drops of tacky glue to the back piece where the magnet will lie. Slip in the magnet and press the magnetized side into the glue. If you want to attach a cord for hanging, add it before assembling the rest of the posy. More string pearls would look nice, or simply use a white cord, gluing the two ends into the inside edges of the heart pocket.